Price: $19990 - Original 95%, Time capsule. The 1969 model Corvette became one of the most desirable Stingrays, even though was not the first one of the third generations of Corvettes later dubbed the C3. After the hastily introduced 68 model, the 69 came from behind with a lot of refinements which made it instantly popular and later a desirable collectible. 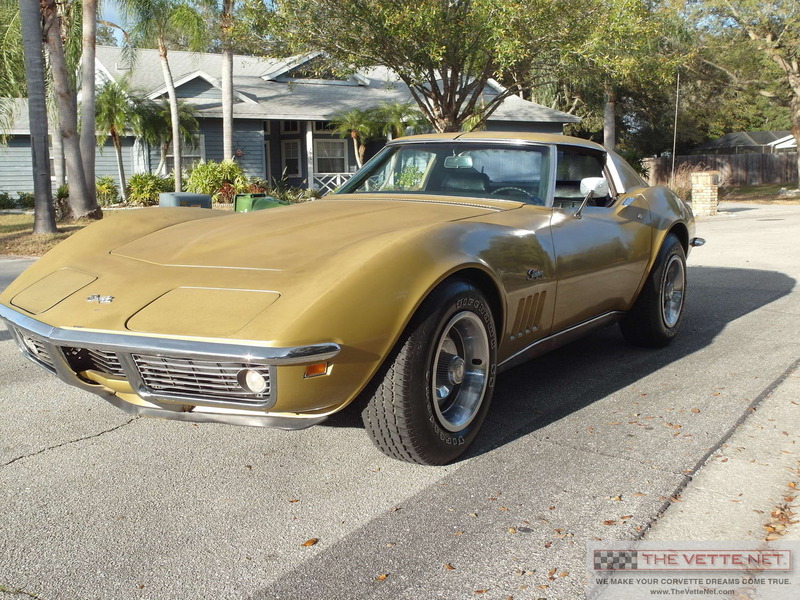 We are pleased to bring to your attention a very special one, virtually a "Time Capsule", a very original Vette with the same owner since the early 70s. We can venture to say that it appears that it may be over 95% original... It is all there: the original laquer paint, the interior, the matching numbers engine and transmission, the smog pump (how many survived? ), the AC... We know that the tank is not original, but that is about all except tires, exhaust and the usual consumables. The factory paint is the correct Riverside Gold which show the right amount of patina for a car that is almost 50 years old. The interior is also the one that came from the factory back in 1969... plus pretty much everything under the hood. Best part that the car is in excellent mechanical condition: all gauges work, AC blows cold, vacuum operates properly, wiper door as well. Brakes were freshened up, AC was recharged, vacuum refreshed... A recent repair bill of over $5000 is available on demand. Nothing to do, but to drive it. Best part is that the Protect-O-Plate is available and comes with the car, plus lots of documentation going back to the early 70s. All in all, this is a great candidate for NCRS "Survivor" judging, also a platform for restoration, but we heard lots of enthusiasts saying that its value is the way it is, as a veritable icon of a by-gone era. Located on the West Coast of FL (Sarasota), we will be glad to assist with delivery nationwide and all over the world. Corvette trades are considered, also, financing is available.